It's time to escape from it all. This is one of our all time favorite movies. The film is not filled with super cars or super fast cars, but there are a couple of great motors in the movie. Several WW2 Benz, BMWs, and of course vintage classic motorcycle. I'm sure most of you have seen or heard of THE GREAT ESCAPE. Starring Steve McQueen, James Garner, Richard Attenborough and many more. Allied P.O.W.s plan for several hundred of their number to escape from a German camp during World War II. This is a short sample of the legendary movie. The full length film can be seen of Netflix or purchase through several movie providers. 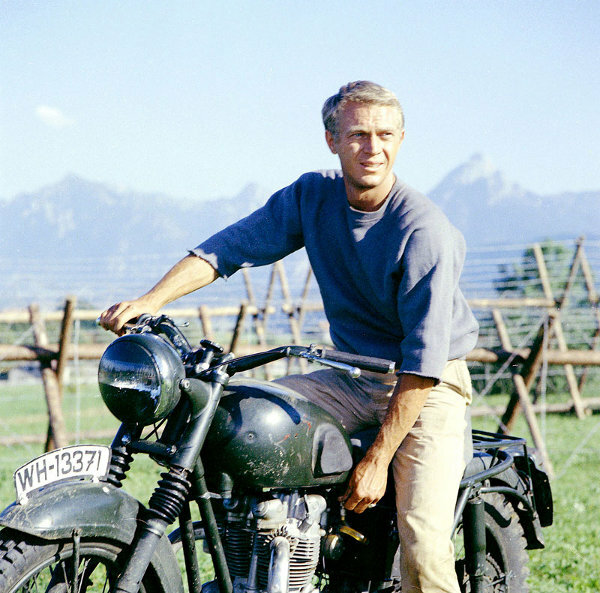 We want to talk a little about the super cool bike which Steve (as Virgil Hilts) hijacks a German warbike, and becomes the center of one of cinema's most famous chase scenes. Four bikes were used for this film. Steve was running a TT Special 650 Triumph. It had been painted it drab olive drab color and an old seat to make it look like a wartime BMW. A real BMW could not be used, because the old bikes did not have rigid-frame. They couldn't take the punishment. The tricks of the camera didn't end with the bike itself. Steve's riding was also too fast for a German stuntmen chasing him. To solve this problem, Steve doubled for his pursuers as well, effectively chasing himself on camera. Pretty cool!